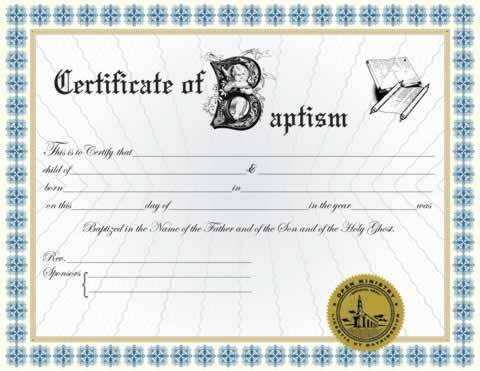 This specialty Baptism Certificate has space to write name of child, name of parent/guardian(s), date and place of child's birth, date of baptism, and signatures (minister, sponsors). The Baptism Certificate I is to be completed by the minister. Decorated with our gold embossed ministry seal. It is great thanks!!! Looking forward to using it!!! I WE WLL BE USING THE baptism certificate 1 as I have 6 baptism to do in the next 3 mouths.. and I will be getting more from the store soon. Received this personalized today in the mail. I'm thrilled with the look of the certificate and how fast it was mailed to me. I would reccomend this certificate to anyone doing a baptism. It's beautiful!